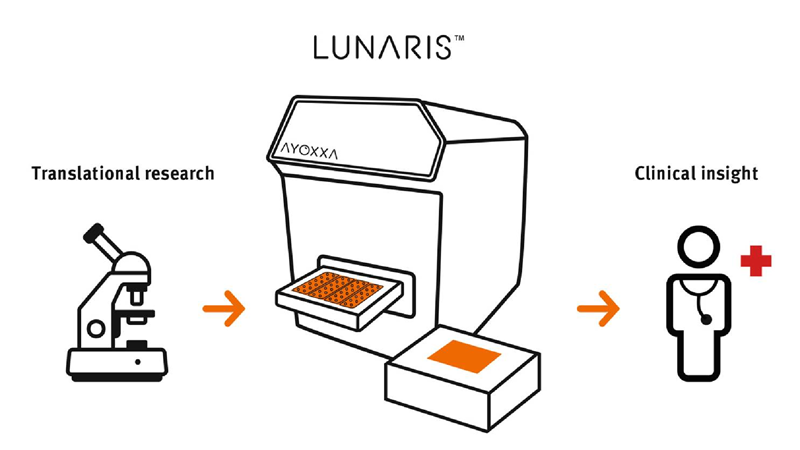 Our LUNARIS™ Portfolio vastly augments your insights into a single sample. Designed to deliver top-quality data on multiple proteins in as little as 3 µL of sample, our current LUNARIS™ Kits quantify secreted and soluble markers of inflammation and immune responses implicated in ophthalmic and other diseases. Combined with the LUNARIS™ Reader and dedicated analysis software, our panels are validated for various clinically relevant sample types. Research that has jump-started enthusiasm for and use of our LUNARIS™ Platform spans various areas and focuses on translating discoveries into clinical applications. Ophthalmology – Working with leading scientists, we have gained expertise in handling and analyzing ocular fluid samples from patients and model systems for biomarker validation, drug development, and possible therapeutic monitoring of ophthalmic diseases. Model-to-man translation – Our panel development strategy aims to facilitate the elucidation of human inflammation physiology based on learnings from cellular and animal models. Immuno-oncology – Research collaborations in immune responses and immuno-oncology have highlighted the relevance of our LUNARIS™ Technology in this field, and opened protein multiplexing opportunities for basic research and clinical applications. Realizing our vision of enabling success in translational research requires a tenacious team of skilled and imaginative people. That is who we are at AYOXXA Biosystems GmbH. Guided by an experienced management and Supervisory Board, our teams in Cologne (Germany), Singapore and Boston (USA) strive to create and offer high-performance solutions for translational proteomics.